Last night, as I was cleaning the kitchen and getting ready to go to bed, I found this letter. 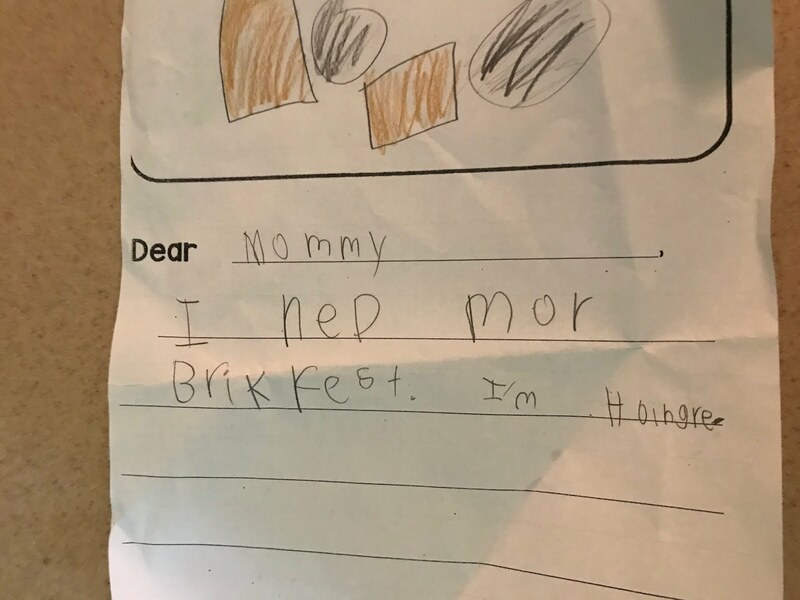 "Dear Mom, I need more breakfast. I am hungry." Umph. As I wrote before, life has been fairly... busy... lately. OK. As a teacher, I totally would have had a child write this letter. 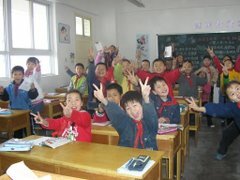 The child complains that she's hungry during a lesson. And, to give her something productive to do about it, I'd tell her to write a letter. The writing distracts her from the hunger, gives her writing practice, and gives her a way to solve the problem. Don't just complain - do something! As a teacher, I totally appreciate this letter. From a parenting perspective... OMG. First the guilt... my poor daughter is hungry during the day! I'm not providing for her... then... wait a minute... let's talk about this breakfast thing a bit, OK? There are two of us involved in this early morning scenario. I'd love to give you more breakfast in the morning. That sounds lovely. Here's our new plan. 1) I will wake you up twenty to thirty minutes earlier so you have time to eat the breakfast I make you. 2) You will immediately jump out of bed, put your clothes on, brush your teeth, brush your hair, and bound down the stairs without yelling at me, your father, your sister, or the cat. 3) You will quickly tell me exactly what you want for breakfast after I give you a choice between two options. 4) You won't change your mind after I've started making what you originally chose. 5) We won't fight about the fact that I'm not preparing a new breakfast for you because you changed your mind. 6) You will quickly eat your breakfast. 7) You will choose a piece of fruit from the beautiful fruit bowl that sits directly in front of you. You don't just pick the sticker off the orange and then hide it under the table, but you eat the orange as an additional part of your breakfast. 8) You will finish your food without announcing "you are full" after taking two bites so you can go play. This sounds like an excellent plan. I don't want you to be hungry in school. Let's work together to solve this one, OK? Today we started the new plan. It didn't go as expected. Or, as hoped. It kind of went as expected. 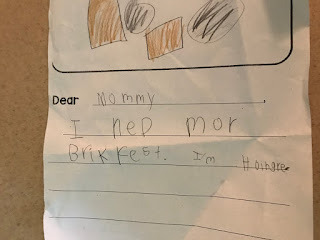 I am so sorry for ever having a child write you a letter like this. I had no idea the amount of guilt/frustration it would cause. I had no idea how trying to get kids ready in the morning is like working a full day. I did it out of love, as I'm sure my daughter's teacher did. But... yeah... I'm sorry. I've neglected this blog quite a bit lately. Partly because I've been busy writing Joey's blog, partially because I'm still trying to figure out how to write about my new adventures as a special education consultant/DIR Floortime Practitioner, and partly because there has just been a LOT going on in my life lately. I like to think I've been balancing it all fairly well - despite the occasionally texts to my closest friends with "OMG why is life sooo hard??" and then "I swear I can do really hard things, but getting my children to brush their hair in the morning is a bridge too far." On Tuesday I walked my kindergarten daughter to the bus stop and my heart sunk. Every student was holding a beautiful bouquet of flowers for their teacher. In all my "managing" I'd totally missed the memo from the PTA about teacher appreciation week. I mean, I knew what week it was, and I was planning to do something on Friday, but I didn't realize there were daily activities. It's such a small thing - the flowers - but in that moment it seemed to represent everything that I wasn't doing this winter. As a teacher I loved the "bring your teacher flowers day" because you get to make a beautiful bouquet out of the variety of flowers children brought you. It's sweet to see all the flowers gathered together, in a way no florist would ever approve of, but also in a way that represents your class. Plus, I love my daughter's teachers and I want them to feel special. Life in the Lipstick Household has been an adventure this past fall/winter. Last fall we learned that my husband had stage 4 Hodgkin's lymphoma. If you know about Hodgkin's you know it's the best of all the cancers and basically curable, but still requires a pretty arduous chemo regimen. It hasn't been an easy winter. Then, about a month and a half before it was all over - when my husband and my four year old already had the flu - I fell and broke my ankle. The break required surgery. Suddenly our family had two parents out of commission. Our family and friends have been amazing. My mother basically moved in with us for two weeks and every one in my family was commissioned to help out with our medical appointments. Just in case you are wondering, moms should NEVER be on crutches. It feels nearly impossible to do mom with crutches. You can't actually get food out of the fridge, carry it across the kitchen, and put it on the plate, and then bring it to your children. And you should see our house. We may drown in clutter if I don't get off crutches soon. I didn't realize how much I straightened during the day until I can't move something from one surface and carry it across the room to put it where it belongs. This mess is the cause of totally missing the "bring your teachers flowers day". I'm sure the PTA letter is under the massive pile of junk on my coffee table where things have been deposited over the last few weeks if I can't intercept first. And somehow, the flowers seemed to be my breaking point. We can make do and make do and make do, until we can't. All those overwhelming feelings hit me in a flood and everything else that hasn't been done - the mothers' day cards still sitting on the table unmailed, the cleaned but not yet returned food containers people brought us food in, calls to make, rooms to clean... it's too much. 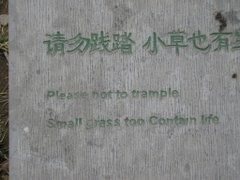 It always seems possible to do the hard things in life - it really is the little things that interfere sometimes. My husband is back to work today after finishing his last chemo treatment, and I should be off crutches by next week. Things are looking up. In a few weeks, hopefully I'll be able to see flowers as just flowers, and not a symbol of everything I'm not doing.